CAVE BEAR INCISOR - PLEISTOCENE CZECH REPUBLIC. CAVE BEAR INCISOR - PLEISTOCENE, CZECH REPUBLIC. Ursus spelaeus Rosenmuller & Heinroth. 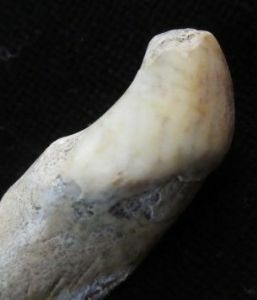 Matrix free upper 3rd incisor tooth from a Cave Bear. From a famous old site in the Czech Republic. This material is rarely offered. Tooth : 5 cm. long.